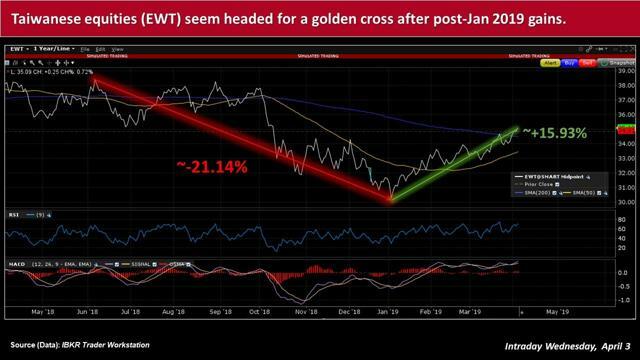 Investors in the week ahead are poised to receive updates on the health of Taiwan’s economic landscape, including its trade balance and rate of inflation, amid slowing exports. Taiwan’s economy has generally been beset by a host of global headwinds, including uncertainties over U.S. trade policies toward major economies such as China, the euro area and Japan. Against this backdrop, Taiwan’s government has been betting on its Forward-Looking Infrastructure Development Program, as well as its consumption stimulus measures, to buoy and expand public and private investment. The infrastructure program, for example, aims in large part to strengthen the nation’s railway systems, where projects have stalled mainly due to insufficient budgets. Taiwan’s economy has generally been beset by a host of global headwinds, including uncertainties over U.S. trade policies toward major economies such as China, the euro area, and Japan, as well as a recent deceleration of Chinese growth. Meanwhile, jitters about Brexit developments have also contributed to the hazy outlook for the country’s economy and financial system. Releases kick-off in earnest Monday with Taiwan’s trade figures for March. However, despite the weakening, the central bank observed that capital equipment imports have risen, and the domestic stock market has rallied on the back of “buoyant international stock markets, bolstering consumer confidence. 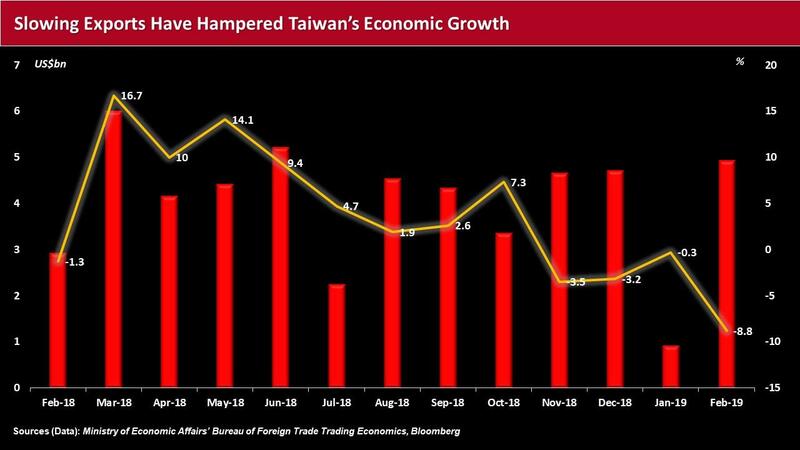 Taiwan’s total trade rose 3.1% year-on-year in January to nearly US$53.7bn, with exports down 0.3% to almost US$27.3bn, while imports increased by 6.8% to around US$26.4bn. According to the country’s Ministry of Economic Affairs’ Bureau of Foreign Trade, the “risk of a slowing in global economic growth continues to increase,” with the “stalemate in the U.S.-China trade war, the Brexit limbo, and a downturn in China's economic growth” among the main reasons for less optimism for the economy. In January, among Taiwan’s top 10 export products, steel exports plunged by 17.0%, followed by plastics, which fell 14.4% -- erasing US$280m in value. Indeed, Taiwan has struggled in recent years to lift its tech-driven economy. McKinsey & Company researchers recently noted “a positive correlation between a country’s rate of productivity growth and its level of digitization,” and Taiwan’s economy is “digitizing unevenly” – underscored by wide variations across sectors, and an overall lag compared to other advanced economies. The New York-based management consultancy had highlighted high tech as the largest sector of Taiwan’s economy – comprising 18% of GDP, with about 55% of the nation’s top public company revenues generated by its domestic tech companies. “Yet the sector faces a series of challenges that threaten to erode its position: sluggish growth in the consumer electronics market, razor-thin profit margins from highly commoditized product portfolios, and intense competition from Chinese competitors that are shifting from making hardware to offering more profitable solutions and services,” McKinsey added. The program, financed by a special budget of more than NT$673bn over a four-year period (2017-2021), intends to spur economic growth over the next 30 years. Elsewhere, market participants will receive a fresh gauge on Taiwan’s rate of inflation after consumer prices in February rose 0.99% from the prior month, mainly due to effects from the Chinese New Year. Taiwan’s central bank expects annual growth rates of CPI and core CPI (excluding fruit, vegetables, and energy items) for 2019 to be 0.91% and 0.78%, respectively. The bank, which has held an accommodative monetary policy stance, generally expects inflationary pressures to remain subdued, amid a downward revision of global GDP and trade growth, as well as persistent uncertainties over international economic, trade, and financial prospects. 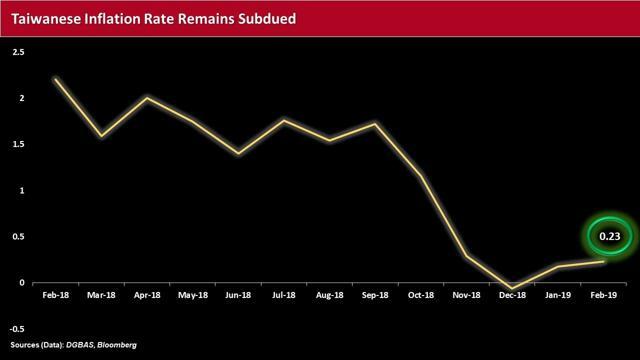 The Central Bank of the Republic of China (Taiwan) at its latest monetary policy meeting kept its discount rate, as well as the rates on accommodations with and without collateral, at 1.375%, 1.75%, and 3.625%, respectively. Investors will likely be keeping an eye on any potential further weakness in exports or slowdown in Taiwan’s inflation rate that could further stymie the country’s growth. Note: This material was originally published on IBKR Traders' Insight on April 3, 2019.